Photowalking in Sofia, I've almost forgotten how good it feels. Especially arriving earlier and looking around for nice shots while waiting for the others. Who knows, maybe they got early too and were wandering around in another part of the park? Anyway, the late summer is a perfect time of the year for this. It's like a golden hour at noon. The sun is bright, but it gets warmer peeking through the yellowish leaves of the chestnut trees. They start to fall early, long before the fall arrives. The contrast between the leaves and the green grass in the park combined with the yellow and green colours of the Sofia park trash cans is just awesome. Or is it not? Photowalking in Sofia, I've almost forgotten how good it feels. Especially arriving earlier and looking around for nice shots while waiting for the others. Who knows, maybe they got early too and were wandering around in another part of the park? Anyway, the late summer is a perfect time of the year for this. It's like a golden hour at noon. The sun is bright, but it gets warmer peeking through the yellowish leaves of the chestnut trees. They start to fall early, long before the fall arrives. 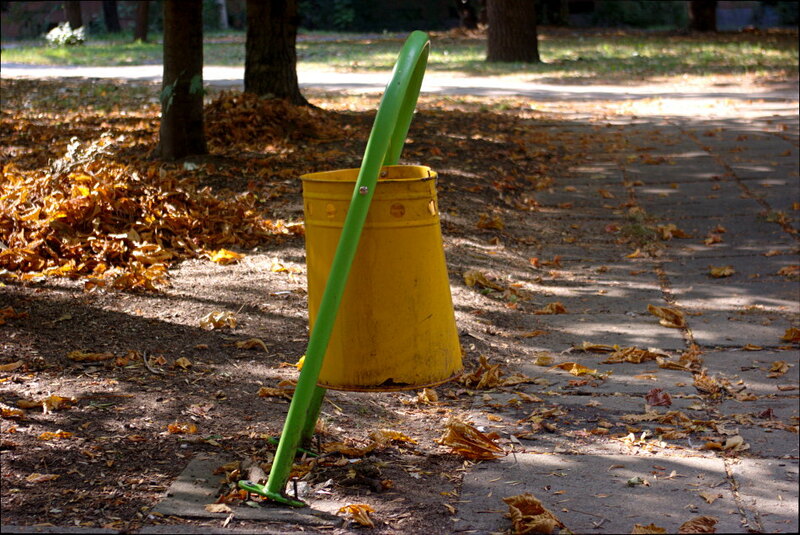 The contrast between the leaves and the green grass in the park combined with the yellow and green colours of the Sofia park trash cans is just awesome.